Reducing Barriers to Care for Super-Utilizers—The federal government reports that five percent of Medicaid recipients can drive as much as 54 percent of all Medicaid costs in a particular area. These people, often called “super-utilizers,” have the most complex needs of any individuals served and have the worst health outcomes. In year one, the NP-HEZ will identify the top adult and pediatric utilizers and create a coordinated approach that leverages NP-HEZ resources to better coordinate all aspects of their care and ensure they receive the best possible care. Providing Employment Opportunities—Financial stability is a key driver in the health of an individual and the health of a community. The NP-HEZ will work with community stakeholders to help ensure that the NP-HEZ provides employment opportunities for the North Philadelphia residents and civic engagement. The macro goals of the NP-HEZ align with the objectives described here, and are summarized well by Ted Dallas, Secretary of the PA Department of Human Services, who says, “By bringing together government, health care providers, hospitals, philanthropy, and community stakeholders, we hope to increase access, improve quality, and reduce health disparities for North Philadelphia families.” DHIP is attempting to be a catalyst toward these goals, as well as to add value through an extensible technology platform. The digital health infusion will begin with establishing a PHM technology platform to support care coordination and associated analytics. This PHM platform will be the primary tool of the community-based care teams, and will be integrated with the HealthShare Exchange of Southeastern Pennsylvania (HSX), the local health information exchange that aggregates data across the principal medical providers for the NP-HEZ. With that foundation, other digital health technologies can be layered on in an organized way to ensure workflow and information-flow compatibility. This initial HEZ will be prototypical for others around the city, so its successful launch and operation are pivotal to the aims of the DHIP, and will be the primary focus in the short term. 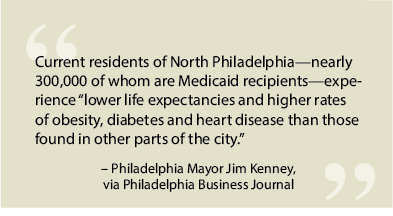 The NP-HEZ covers 15 zip codes served by the main coalition of health providers: Einstein Healthcare Network, Temple University Health System, and Hahnemann University Hospital. Additionally, the City of Philadelphia, The Chamber of Commerce for Greater Philadelphia, the PA Department of Human Services, and the PA Department of Education are also partners in this initiative. The Chamber of Commerce has asked GSI Health, who is also organizing the DHIP effort, to be its representative in working to implement the NP-HEZ.